Overweight Dog: Is your small Dog Obese? Overweight Dogs face many health problems that their slimmer cousins avoid. Do you have an overweight dog? 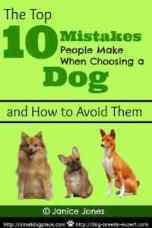 Perhaps you'd like to ignore the situation, but if your Small breed dog is overweight, you are cheating him out of the chance to live the best possible life. Overweight Small breed dogs are at increased risk of developing painful conditions like osteoarthritis and life-threatening ones like respiratory, cardiovascular disease, Type 2 diabetes, high blood pressure and many forms of cancer. We all know that it is very costly and difficult to treat these diseases once they have been established. Prevention is much cheaper and easier. The bottom line: They need to go on a dog diet and get more exercise. That equals approximately 80 million U.S. dogs and cats. I don't want to imply that only small dogs are at risk to putting on a pound or two, but they do seem to have their share of obesity cases. 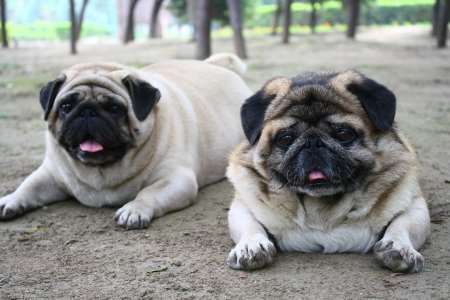 Many small breeds are at risk for obesity. Small breed dog are not as active as larger breed dogs and one of their favorite pastimes is to cuddle up on your lap. It’s so easy to enjoy their company and their pure relaxed contentment on your lap that you forget they need exercise, too. Another problem that small breed dog owners face is a two edge sword. These dogs learn very quickly. In a weak moment, you give them a great tasting snack and they will never let you forget it. Too little exercise and too many high calorie snacks only lead to one thing--an overweight dog. And, canine obesity is a serious health concern. Finally, as owners of small dogs, we often don't comprehend the actual daily calorie count of our little dogs. For example, The Pet Obesity Prevention Organization maintains that for a 10 pound dog, a daily intake of up to 275 calories is sufficient. For 20 pound dogs, they will need up to 400 calories. That equates to about 1/2 to 2/3 cup of dry kibble per day. As adult people, we could never conceive of surviving on that small ration of food. Your small breed dog is at your mercy when it comes to meals and snack time, and the only discipline being exercised in doggie's diet is yours. It is not always easy to look beyond those gorgeous pleading eyes, but when you give in to your dog, you may be doing her more harm than good. Many of our beloved pets are not living out their life expectancy due canine obesity. As with humans, if you have an overweight dog, the bottom line is that the dog is taking in more calories than necessary. Period! If your small breed dog is overweight and is otherwise healthy then she is eating way too much and/or not getting the exercise she needs. There are not one size fits all answers to this question. Most people who are told (normally by their veterinarian) that their dog is overweight, may at first be denial. Next they want to know exactly how much the dog should weigh and how much weight needs to be lost. If you are a person who loves the numbers the best way to start on a weight loss program is to get a good scale. You can use your own bathroom scale, weigh yourself, weigh both you and your dog and subtract the difference. This method will give you a pretty good estimation but may not be exact. Another method is to purchase a scale especially designed for weighing small breed dogs. You can get a much more accurate reading on these types of scales. 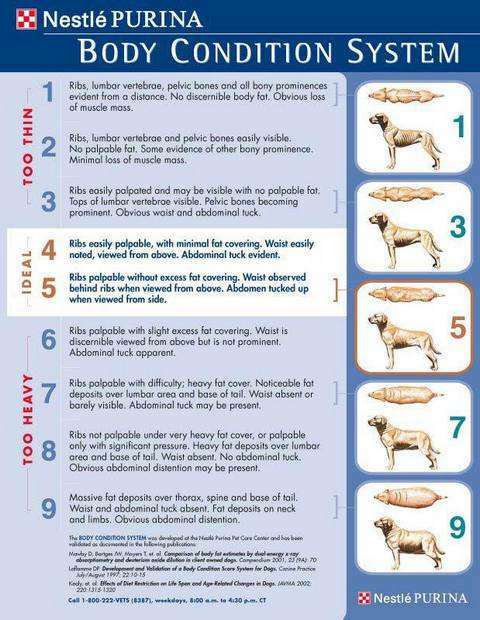 Another way to determine the ideal weight is to use the Purina Body Conditioning Chart. You can visually see the difference between an underweight, overweight and ideal weigh by visualizing the chart and your dog. You can also physically feel for ribs. You cannot see or feel the ribs. There is massive fat deposits over much of the body. Overweight. What Causes small dogs to be overweight dogs? "Lola won't stop pestering me unless I give her a treat and she won't settle at night unless he gets his special sausage treat." Good for Lola! She has successfully learned how to manipulate this owner into a treat for herself. Talk about negative conditioning here. Lola’s owner hasn't trained her properly to have some manners and instead Lola has managed to train her owner. She knows exactly what being a nuisance will do—it will get her a treat and eventually the pounds start to mount on her. There is no shortage of dog treats on the market today. Just visit a supermarket or pet store and you will notice that there is often an entire isle devoted to treats alone. Giving a dog a treat without making them work for it not only hurts the relationship, it undermines any training you are doing and it puts on extra pounds. Dog treats are only part of the problem. As humans, we like to snack, especially while watching TV. If our favorite canine is snuggled closely, it’s very easy to give her the same foods you are eating without paying much attention to the amount your dog is consuming. How Many Calories is too many calories: Consider this. According to the veterinarians at the Advanced Veterinary Care Centers, there are formulas that can be used to calculate exactly how many calories your dog will need to maintain his current body weight. Furthermore, you can go one step farther and calculate how much he needs to reach his ideal body weight. Luckily, for your mathematically challenged individuals including myself, they have broken it down into a chart. In human terms, a 250 calorie snack would include: 1 apple topped with 1 tablespoon peanut butter and 1 cup fat-free milk. If you have an 11 pound (5 kg) dog, the equivalent calorie requirement would be approximately 2 soft tacos from Taco Bell and a bottle of water. When thinking about calories, we must take the size of our dogs into consideration. One of the most common excuses for overweight dogs in this country goes something like this: "Bella won't eat dog food." So, then what does Bella eat? You got it, table scraps and whatever it wants. Here we are not describing a well-researched home cooked diet, just what’s left over when the people finish eating. Oftentimes overweight dogs also become ones who are excellent at begging at the table. It only takes a couple of times when an owner is in an overindulgent mood to get the begging habit started. Once little Bella has succeeded in training the owners to give her what she wants, the habit gets entrenched in both the dog and the owner’s mind. As we all know, habits are hard to break. Sadly, though the dog is paying the price for it physically. Small breed dog are much more likely to prefer food from his owner’s hands then a dog bowl. Here again, the dog is not getting the proper nutrition, but has learned still another bad habit: Begging. Most Small breed dogs do not need a ton of exercise. They can often get most of their requirements by following you around the house every day or running around the yard. Some enjoy a quick burst of energy where they run wildly seeming to enjoy every moment. They also enjoy short brisk walks with their favorite human. Sometimes there is a medical reason for a dog gaining weight. If your dog is experiencing weight gain, you should have her examined by your Vet to check for heart, thyroid or other metabolic disorders to rule out a possible medical cause. Some common diseases associated with weight gain include hypothyroidism and hyperadrenocorticism or Cushing’s disease. Small breed dogs as a breed are prone to thyroid problems. Before you decide to put little Bella on a diet, check with your veterinarian. Get an accurate record of his weight and determine the ideal weight for his breed. If she is a purebred dog, you can get the breed standard on the AKC website. Their weight should be proportional to their overall size. Next you will want to become fluent in reading dog labels to find the best dog food that Bella will eat. The easiest way to manage a diet is to remove all treats entirely and then substitute them for something healthy and low calorie such as carrots, celery, broccoli or asparagus. Many dogs love the crunchy feeling that accompanies nibbling on raw veggies. First take a good hard look at the food you are feeding. The FIRST ingredients present in the bag of food should be MEAT or meat products, NOT grains like corn. Look at the first five ingredients and compare two or more brands. Premium or higher quality dog foods will have more meat, fish or poultry as the main ingredients. Small breed dogs do much better on commercial diets that do not contain the grains, corn, wheat or soy. Now that you are a dog food label expect, you can make some excellent choices for a weight loss diet. Choose a food that has a high protein content that comes from an animal source. Meat or Fish are listed as meals and are included in the first 5-7 ingredients. A diet high in fiber will help control blood sugar and help reduce weight. (Know that this is also going to increase the amount of ecretment passed each day.) In the dog food look for fiber sources such as vegetables, brown rice and oats, rice hulls, corn and corn by-products, soybeans, beet pulp and bran. Some of these sources are better than others. Remember though, that the ingredients listed on the label are in descending order with the heaviest weighing ingredient first. High fiber dog foods may be a good choice if supplementing is not working. You can also give the dog Metamucil. Be careful that you are not overloading the system. Diarrhea is usually the result. A lower fat diet will also help but don't go overboard with charbohydrates as they will also add weight. L-carnitine plays a role in fat metabolism which will result in maintain and develop lean muscle mass. 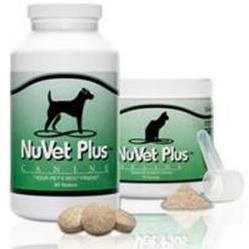 Added glucosamine and chondroitin if your dog is overweight due to joint pain and cannot exercise. In the meantime, if she begs – do NOT give in. If he has finished the bowl of food and looks expectantly at you for more, give him a bowl of fresh water instead. If you must give him something when he begs, offer him a couple pieces of his normal kibble. Sometimes this works because it has your scent on the food. If he refuses, shrug your shoulders and walk away. At the end of two weeks, weigh him again. If he has lost some weight, great, then stick to this schedule. If not, reduce his intake and also find out if someone else in the house is sneaking treats. Doggie Diets are only successful if everyone in the household is on the same page. If you're wondering about low calorie diets for overweight dogs, you can purchase them, but many vets don't like to recommend them as they have very restricted fat levels. When they produce dog foods with reduced fats, the carbohydrates are increased. When dogs ingested additional carbohydrates, their bodies must produce extra insulin. What happens is that the extra insulin production tells the dog’s body to store the unused calories as fat. It becomes a vicious cycle. If you'd like to try one, here are a few of my recommendations. No wheat, corn, soy, artificial colors or preservatives or meat by-products. BLUE Life Protection for Senior Dogs features the ingredients to support their overall health and well-being. Exercise is important especially for dogs that are overweight. To benefit from a walk, however, requires you to pick up the pace. A casual stroll stopping every few minutes to sniff is not going to burn off many calories. A short brisk walk is better than a long leisurely stroll. Play Fetch: Not all small dogs enjoy this game, but if yours does, by all means play it daily. Your dog will get plenty of exercise and you will have some great bonding time with him as well. Does your dog get those bursts of energy where running wildly from room to room may at first glance suggest some form of mania has overtaken your otherwise calm dog. No, dogs love to run and if you have more than one dog, you are likely to witness a fast paced game of catch on more than one occasion.If possible, encourage this, but don't overdo it. We all love our pets and want what is best for them. Sometimes we tend to kill them with our kindness by providing unhealthy diets. There are far better ways for us to show our love than with too much food. Your pet will almost certainly enjoy spending more time on walks or playing games with you than he or she would when eating alone. There are plenty or nutritious foods which have loads of doggie palate appeal out there, so you should never feel like Bella is missing something by not dining at the family table.